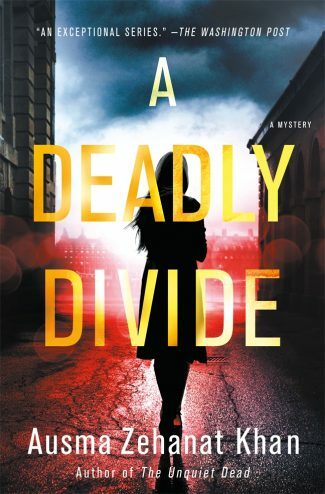 A Deadly Divide by critically acclaimed author Ausma Zehanat Khan is the fifth book in the Rachel Getty and Esa Khattak series—a piercingly observed, gripping thriller that reveals the fractures that try to tear us all apart, from the once-tight partnership between detectives Esa and Rachel to the truth about a deeply divided nation. The watcher followed Esa Khattak home, observing the detective in the dark. For all his skills and aptitude, Khattak didn’t know. He’d never known that he was being followed because signs of pursuit had been cleverly disguised. There had been moments when the temptation to leave a calling card had been nearly too much to resist. The furtive delight to be gained from witnessing Khattak’s response. Of tasting his sudden panic at how close the threat had come. But the watcher’s patience was limitless. The moment to act would be soon. And when it came, it wouldn’t be decided by a note left at Khattak’s door. The endgame was playing out; the climax would be profound. Just outside the door to his house, Khattak answered his phone. He had seemed tired when he’d searched for his keys, but now his features softened, a smile curving his lips, as he set down his case at his side. It would be the woman, then. The woman Khattak had left in Greece, the one he’d since come to love. The woman was intriguing because she mattered to him. Tracking her travels abroad had posed a new kind of challenge, but Khattak was, by far, the more riveting of the pair. The watcher kept waiting for a misstep. For a sign that Khattak was someone other than he seemed. But his private face was not all that different from his public one, except where women were concerned. That was when the detective finally let down his guard, just as he was doing now, laughing with the woman on the other end of the phone. He was warm, expressive . . . perhaps even emotional. Words not often used to describe Inspector Khattak. But now there were next steps to be considered. Wait for Khattak to leave his house in the morning, or return to Greece to resume surveillance there? Or do neither of those things and head west to the home of Sergeant Rachel Getty, a woman of significance in Esa Khattak’s life. There were other possibilities, too. But these were the most compelling. The strike, when it came, would be hard. A moment of decision, now. The watcher rubbed a cold steel weight with careful, clever hands. Paused for the space of a breath. Then held it up to shoot. Blood saturated the walls, the stink of it creeping into his nostrils. By any measure, the scene was sickening. It was more devastation at a single crime scene than Esa Khattak had ever witnessed. From the green tinge to Rachel’s skin, he could see it was the same for her. Their eyes met across the hall, sharing the moment of horror. They’d been called at once and had arrived as quickly as possible after the shooting, a mere matter of hours. Rachel was at the door canvasing the mosque’s parking lot. Khattak had been permitted access to the narrow cordon set up by crime scene technicians in the midst of the dead. He wore a protective forensic suit, Superintendent Martine Killiam at his side. He photographed the scene methodically, finding it easier to deal with the sight of bodies through the distancing mechanism of his lens. He made the count to himself. Two bodies in the corner had fallen back against the small shelf of books. Two more were slumped sideways in the main prayer space, where the green and white carpeting was soaked through. An- other body was pitched against the mihrab, its white robe spattered with starbursts of blood. The delicately tiled niche had been damaged by a spray of bullets, its shards scattered over the carpet. A tiny turquoise flower lay inches from Khattak’s feet. He turned in the opposite direction, to the scene he’d put of photographing to the end. Two bodies close enough to touch and farthest from the door, one huddled inside the protective embrace of the other. A father and his small son. The assailant had targeted both. A small community, a small mosque, with seven dead in the prayer hall. And there was one more. Killed in the small passageway that led from the imam’s office to the main hall, this time by a single gunshot to the head, assailant and victim facing each other. The man who Khattak presumed had shot them was sitting on a chair at the far end of the hallway, a semi-automatic weapon cradled in his lap. It was an AR-15. He was surrounded by Sûreté officers who spoke to him in French, patient with his bewilderment. Khattak glanced at him once, a comprehensive glance. Long enough to see the small gold cross he wore on a chain at his neck. And to note the details of his clothing: A gray cardigan worn over a blue shirt. Black trousers and formal dress shoes, slightly scuffed at the toes. The man in the chair seemed slight and insignificant, his thin patch of hair compensated for by a full-grown beard, his eyes wide and dazed. His clothes, hands, and face were free of blood spatter, but his hands were locked around the weapon. A powerfully built man with an air of command was speaking to the man with the gun in a surprisingly gentle voice, his tone respectful and kind. Esa couldn’t make out his words, but after a few minutes the gun was released into the hands of the technicians. A moment later, the man in the chair was helped to his feet and escorted from the mosque through a side entrance. Khattak turned to Killiam. The heat inside the mosque was stifling, yet he found his hands were cold. He put away his phone. “No handcuffs?” he asked her, fighting the tremor in his voice. Killiam shook her head. She’d made her own inventory of the scene, her sharp gray eyes missing nothing. She was wearing her dress uniform, the stripes at her shoulders indicative of her rank, and after a minute the man in charge of the scene nodded at her in acknowledgment. She nodded back. Khattak took a moment to think it through. Killiam had requested the presence of Community Policing detectives on-site for a reason. She’d accompanied him personally and not only because she expected Esa to do damage control in the small community that attended the mosque. Their relationship had progressed beyond that. A new team had gathered at the entrance to the mosque. Lemaire went over to speak to them. Killiam straightened her jacket, speaking to Khattak in an undertone. Killiam was watching Lemaire, a faint frown settling between her eyebrows. Lemaire looked back over his shoulder, fixing them with a penetrating glance. Khattak didn’t have the answer. What he did have was questions raised by the way the priest had been dressed. He was about to raise this when Killiam swore under her breath. Khattak followed her line of sight, to Lemaire and his efforts to coordinate the various branches of police insisting on access to the scene. His voice cut cleanly across the clatter. But it wasn’t Lemaire who had drawn Killiam’s attention. In the flickering light cast by ambulances and police cars, a hastily constructed platform had been arranged. A coterie of reporters were gathered in a circle around a neatly dressed woman in her thirties. Other press huddles had begun to form as well demanding the attention of local officials. “We need to control how this shooting is covered from the outset.” Killiam sounded worried, a rare emotion for her. “Lemaire should get out there, then,” Khattak said. But when Killiam glanced back at him, her gray eyes frankly assessing, he understood at last why he and Rachel had been allowed access to the crime scene and, more important, why Community Policing had been called to assist at this shooting at a mosque in Québec. She was expecting him to manage the public response to the crisis— to give it the Community Policing Section’s sanction. And to fulfill the CPS mandate, which was to play a mediating role between minority communities and law enforcement where violent crime had occurred. But looking across at the gathering of reporters, he knew that nothing about the shooting would be easy to manage or suppress. Because one of his chief adversaries was speaking even now. Copyright © 2019 Ausma Zehanat Khan. Comment below for a chance to win a copy of A Deadly Divide by Ausma Zehanat Khan! A Deadly Divide Comment Sweepstakes: NO PURCHASE NECESSARY TO ENTER OR WIN. A purchase does not improve your chances of winning. Sweepstakes open to legal residents of 50 United States, D.C., and Canada (excluding Quebec), who are 18 years or older as of the date of entry. To enter, complete the “Post a Comment” entry at https://www.criminalelement.com/a-deadly-divide-new-excerpt beginning at 3:00 p.m. Eastern Time (ET) January 22, 2019. Sweepstakes ends at 11:59 a.m. ET February 5, 2019. Void outside the United States and Canada and where prohibited by law. Please see full details and official rules here. Sponsor: Macmillan, 175 Fifth Ave., New York, NY 10010.
please count me in , I would love to read this book. I love this series! Can’t wait to read A Deadly Divide! I love this series and the newest one sounds very intriguing, I can’t wait to read it. Ausma teaches us something new in every book, in addition to being very entertaining and holding our interest. I love this series. Can’t wait to read the new one. I love this series! The stories are always relevant and kind of sad but so good! he start isvery good. The mystery has landed its hook and I want to read more. I really like the way this is written. I had not previously heard of this series, but it sounds very good. Would love very much to read this book. Captivating series. Intriguing and enjoyable excerpt. Thanks. Unique series and wonderful setting. Love to read this novel. The book starts with a mystery and promises more. Would love to read it, and better yet, to win a copy to read and review. Compelling series which interests me greatly. The excerpts are compelling. Sadly relevant to our current political climate. Intriguing! Thank you for the opportunity to win! Caught my attention right away. I’d like to know “who done it”. It had my heart racing immediately. I want it! I am definitely going to read this! Sounds very interesting. How have I missed this series? This is a definite must read!!! Appears to be an excellent addition to the series. Hopefully I am now a registered user. This looks like a thrilling read!